Atlanta rapper 'Columbia BT', 42-year-old Tommie Walker, was indicted on federal drug trafficking charges. Juan Carlos Garcia-Martinez and Samuel Anchondo-Galaviz were also arraigned on charges of drug trafficking and possession with intent to distribute cocaine. 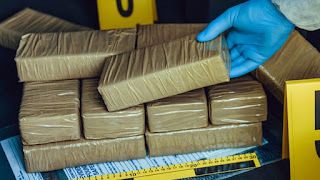 Cops confiscated $220,000 in cash and 135 kg of cocaine. The drugs are said to be worth $4m.